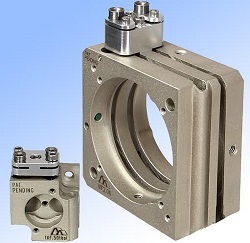 THE LATEST series of optical mounts from Siskiyou enable high resolution (4.5 arcsec) adjustment in two rotational axes with excellent long term stability, in a format said to be ideal for space constrained applications where mount accessibility is limited, says the company. Specifically, Siskiyou IXF2.0t series mounts feature top adjustment, enabling them to be directly bulkhead mounted, or placed in close proximity to other system components. The top adjustment mechanism incorporates a patented torque interrupter to prevent rotation of the adjustor screw from imparting any unwanted movement to the mount. And, to prolong mount lifetime, the adjustment threads are swaged at the end to prevent the mount from going past its intended 5deg range of travel. IXF2.0t series mounts are designed to hold mirrors and beamsplitters having standard diameters of 0.5 inch, 0.75 inch, 1.0 inch , and 2.0 inch , and are available in two different materials. A nickel plated steel version offers superior mechanical and thermal stability, and is intended for a broad range of laser applications, especially in those in which immunity to shock, vibration and thermal cycling are important. An aluminium version offers low weight and vacuum compatibility, making it ideal for uses involving deep ultraviolet lasers and aerospace (flight) applications.